Here at Northside Salvage in Rochester, NY, we are crazy about cars. Why? The obvious reason is because cars are our livelihood, but the other reason is because we make an environmental and economic difference when we salvage vehicles for recyclable parts. Any sustainable effort improves the future of our planet. Each car that comes to our lot has potential to be salvaged for re-usable parts and for valuable metal reproduction. The cool thing is that scrap metal recycling in Rochester, NY can take on forms beyond just recycled car materials. Below, we share a few incredible examples of novel scrap metal uses. From artwork, to sculptures, and scrap metal news, we hope you are as inspired as we are by these scrap metal initiatives! If you wonder what good a pile of trash is, maybe this will change your perspective. This is what happens when one person sees potential in a heap of junk. This careful masterpiece is transforming the way we see scrap. See for yourself! A young man in PODGORICA, Montenegro took scrap from auto parts to a whole other level of awesome. He made Transformer statues with them proving that a little salvaging and innovation can make your childhood heroes come to life. “The towering figures, mostly made of old car parts and other waste, have been placed outside cafes, restaurants and on the city’s main square.” We want to visit each one of these masterpieces. 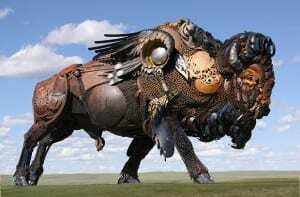 For a fun show of scrap metal genius, take a look at these sculptures John Lopez makes from, well, scrap metal. Could the sculptures be more accurate? They are all in motion which gives an incredibly powerful look to each image. Lopez crafted powerful, majestic creatures that demand your attention and give scrap metal another purpose. A town in Colby, Kansas proves that everyone can make a difference in the community. This video reveals one Colby woman named Lana Johnson’s, efforts to give back to the community. She is making beautiful creations out of recycled metal to display around the town. She is spreading a unique view of beauty hoping to show that potential exists in every part of the community. Lana is proud of her city and wanted to give it her metal gifts. In return, the city of Colby is inspired by Lana’s sustainable artwork and flaunts it all around the city. This is not just any hand sculpture. It’s special. 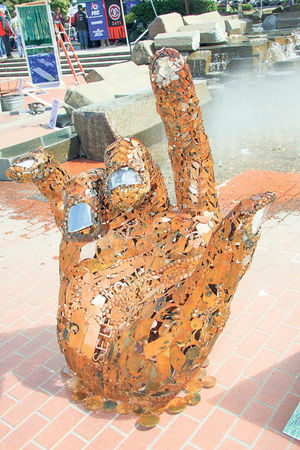 This hand was created out of thousands of scrap metal pieces. That’s right, thousands. Artist Tom Jackson from Portland had a vision to reuse metal to display a meaningful symbol of care and appreciation. We love how the hand is making a subtle, “I love you” sign in sign language. This sculpture impacted over 900 people at the Recycles Arts Festival in Vancouver. 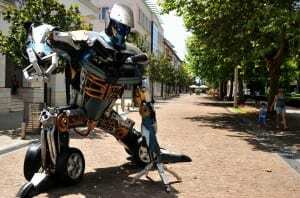 Whether it is metal fashioned into a symbol of love or a Transformer sculpture that wows onlookers, people can use scrap metal to have new value. The value of metal is endless and the possibilities for creative avenues continually inspire us. If you have seen or made something awesome out of scrap metal, let us know! We want to share all the possibilities that scrap metal has.